Just after dawn, as the motorboat pulls out of Pelican Bay, we start to prepare ourselves for the dive, pulling on pre-dampened wetsuits over our bikinis and leaving them hanging half-open at our waists for the rest of the journey. Frigate birds fly overhead, their distinctive red necks deflated as they wait to see if we’re offering them breakfast. Disappointed, they soar towards a flock of blue-footed boobies hunting nearby to bully the boobies and pirate another meal. The glorious Galapagos Islands shimmer in the bright sunlight as we speed past Santa Cruz and Baltra, Dafne and finally arrive at North Seymour. A large manta ray skims along just under the surface. At first, just a shadow in the distance, we get close enough to see the 4m wingspan of this magnificent creature, with its wingtips breaking the surface as it cruises alongside. We anchor in the channel between North Seymour and Mosquera to listen to the dive brief and finish putting on the rest of our gear: weight belts and fins, masks and finally our BCDs with tanks and regulators attached. The language of the dive has been discussed. We all know how to communicate underwater. Twenty meters under the Pacific Ocean there is a completely different world where nothing above the surface matters. Unless you have been scuba diving, it’s difficult to describe the feeling that envelopes you when you roll backwards into the water and then descend to the first meeting point. The only sound you can hear underwater is your own bubbles as you exhale. A small group with a very experienced dive guide, we buddy-up and head into the channel, adrift on the current which carries us along. Almost no effort is required. I barely wiggle a fin. My buddy drifts along beside me. White-tipped sharks rest of the ocean floor, letting the cool water rush over them. Minutes later, we find ourselves in the middle of a large school of yellow and black striped angelfish. We drift over impressive lava formations and colorful corals until we notice that some of the pretty pink rocks aren’t rocks at all. They’re fish. Scorpion fish. 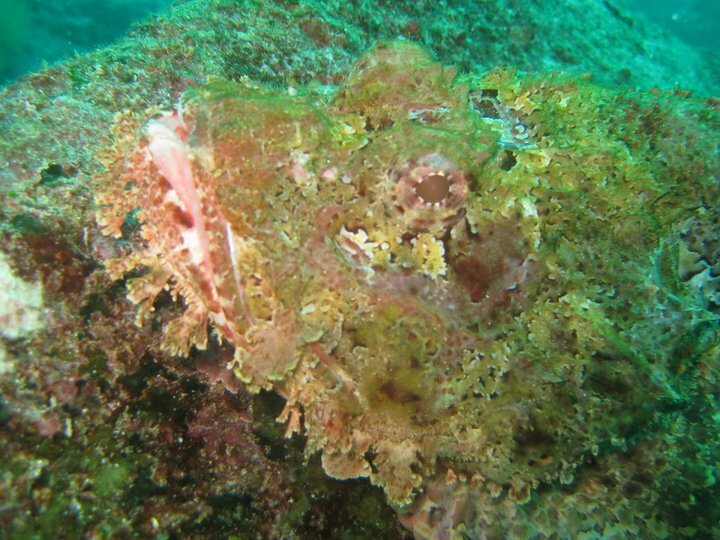 The Galapagos Scorpion Fish is one of the most venomous species in the Pacific Ocean. Responsible divers in the Galapagos know not to touch anything, so we are never in any danger of being stung by this cleverly camouflaged fish. Starfish abound in all shapes and colors, clinging to rocks and corals as the current sweeps over them. An octopus hides in a narrow crevice, its tentacles stretch over the rock as it moves ever-so-slowly across the rock face to find a more spacious hiding place. Enormous Moray eels peek out from their rock caves, mouths open to allow the Pacific cleaner shrimp to wash their faces for them. Outstanding service, if you ask me! During the dive we glide alongside elegant Eagle rays, and see a large school of Devil rays overhead. Concealed Stingrays shoot out from their hiding places in the sand and a large Manta ray circles overhead. A massive Pacific green turtle snoozes on the sandy bottom, ignoring us as an underwater photo-frenzy takes place above its head. After a fifty-minute dive, we slowly ascend, making a safety stop a few meters below the surface. As we hold hands in a circle and dance, wiggling and shaking our hips, trying not to laugh out loud and lose our regulators, our friendly Manta ray sweeps by one last time to wish us farewell. On the surface, we board the boat once more, all talking at once, such is the excitement of yet another great dive in the spectacular Galapagos archipelago. Would you like to come diving with me? Ask Footprints how. Footprints Ecuador helps you custom design and plan your trip to Ecuador, inc. Galapagos Cruises, Island Hopping, Scuba Diving, and also travel on the mainland inc. Otavalo, Cotopaxi, Mindo, Quito, Cuenca & more. 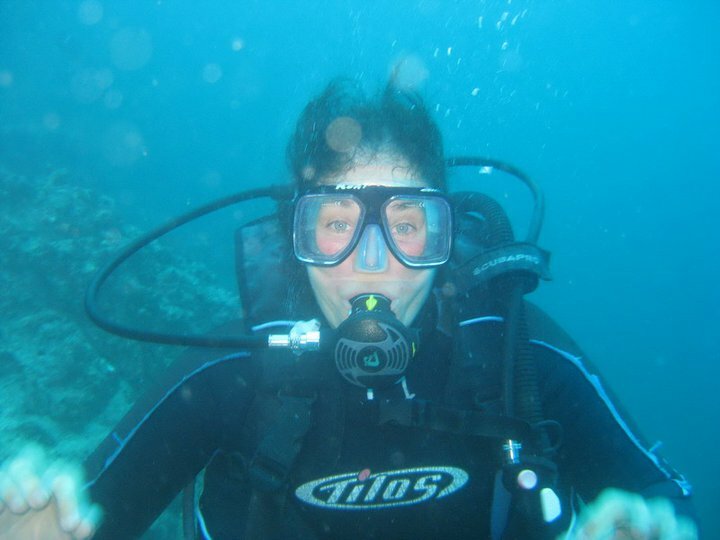 Go Scuba Diving in the Galapagos! Footprints offers personal one-on-one consultation to help you plan the trip of a lifetime to Ecuador & the Galapagos Islands with no-fuss itineraries making the most of your time and budget, catering to your specific interests and requirements. This entry was posted in Birds, Ecuador, Galapagos Cruise, Galapagos Islands, Marinelife, Scuba Diving, Travel, Wildlife and tagged blue feet, blue footed boobies, boobies, corals, Cruise, devil rays, Diving, Ecuador, Exotic, fishing, frigate birds, Galapagos, Galapagos Cruise, Galapagos diving, Galapagos Islands, Galapagos Tour, hunting, Lava, manta rays, marinelife, North Seymour, octopus, pirates, seabirds, sharks, stingrays, wildlife. Bookmark the permalink.